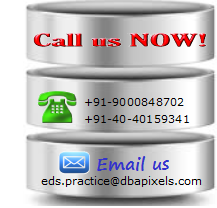 DBAPIXELS provides Emergency DBA Support for Oracle databases and Oracle RAC. We call it as Immediate Oracle Assistance in oracle emergency tasks. We can assist you with your mission critical Oracle production database problem. We can understand small to Large critical databases with various versions of Oracle on different type of operating systems and hardware platforms very efficiently and able to resolve every mysterious issues. Our target approach would be to make your database online again in case of recovery scenarios, Fine tune the database in case of performance issues, Successful completion of assignments in case of Demand based activities, Resolving Urgent or critical oracle issues to get your database back to normal again and safeguard your data etc. We understand that problems with your oracle database environment can have critical impact on business continuity hence we provide precaution steps, Fallback plan/Back-out plan and issue resolution strategy for solving every minor to severe issues and for Demand based activities. We use our documented processes to ensure that all tasks are executed in an orderly and predictable manner. Standby server out of sync due to network or server maintenance. Performance degradation after Oracle Upgrade or after server-to-server migration or after OS change etc. To troubleshoot database systematically when things go wrong. Oracle Issue Resolutions like Troubleshooting of any mysterious database error, Locking issues, DB Hanging issues, Memory issues, Various Oracle RAC issues, Data Guard issues and Streams issues etc. Any abnormal behavior of your Oracle databases like every Monday issue [Fixed any Weekday], typical error messages of Oracle or experiencing any mysterious behavior of the database program etc. Demand Based Activities like migration, Reorganization, DB Refresh, Holiday Support, Mission critical project mentoring, Supporting Special activities like IP Change, OS Upgrade, Storage Upgrade or maintenance, UPS Maintenance, Unplanned Outages, Data Center movement etc. You can provide secure external access to your Oracle database servers via secure connections such as VPN or over the internet and grant us permission to enter your oracle database server. 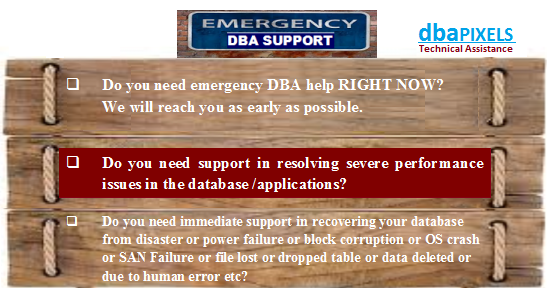 2.All you have to do is to just call us for Emergency DBA Support or quickly fill the Enquiry form.